Kyoung Lee Swearingen is an Assistant Professor of Design and Moving Image Production at The Ohio State University. With over decade of experience as a Technical Director of Lighting at Pixar Animation Studios and DNA Productions, Kyoung’s filmography includes Ratatouille, Wall-E, UP, Cars 2, Toy Story 3, Brave, Monsters University, Presto, La Luna, The Blue Umbrella, Mater’s Tall Tales, Partly Cloudy, Ant Bully and the Jimmy NeutronTV series which had claimed numerous awards from the Academy Awards, BAFTA, Visual Effects Society, The American Film Institute, as well as many others. Kyoung’s latest collaboration, “Sonder” is an animated short, created by 144 artists, designers, and engineers all around the world, premiered in Berlin and has claimed many international awards, and was shown in various film festival globally including the Edinburgh Short Film Festival 2018 in England, ASIFA- South 2018 in Busan, Korea, Canberra Short Film Festival, 2018 in Australia. 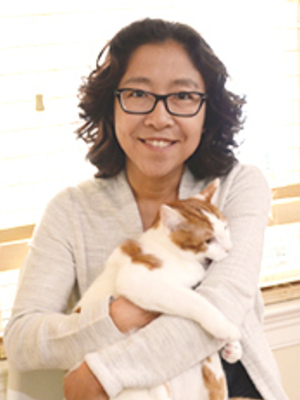 Kyoung’s passion for converging digital and physical mediums through emerging technologies led her to her current research, promoting human-centered collaboration in games and animation between the developers, the players, and the players vs. the game. Her latest collaboration with Assistant Professor, Scott Swearingen, “Wall Mounted Level” is a collaborative, multiplayer game that uses digital projection and physical sculpture to promote reconciliation between players through touch interaction and narrative. Wall Mounted Level has been invited to show in many international conferences such as ACM SIGGRAPH, IFIP-ICEC, IEEE- GEM, and HASTAC and was awarded as best ‘Innovative Game’ and best ‘Social Impact’ game at the Montreal Independent Game Festival 2017.